The IdeaPad Y700 does a good job of summing up Lenovo's new approach to gaming machines. 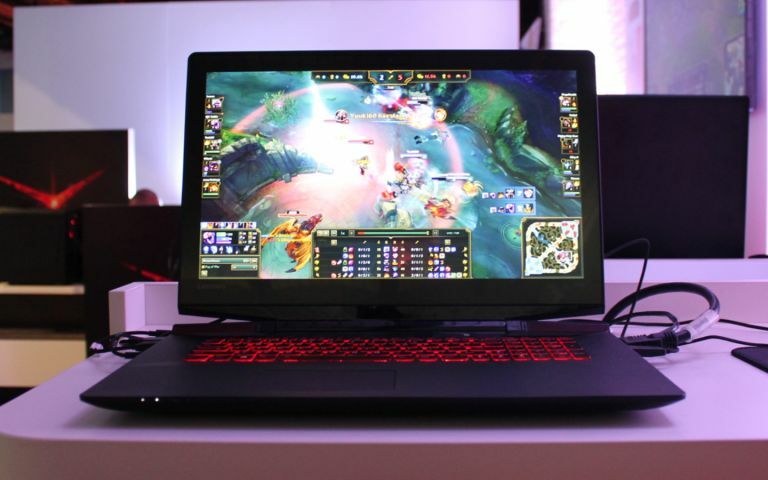 One of three gamer-friendly devices unveiled at IFA 2015, it boasts a sharp, angular chassis, a menacing black-and-red design and specs that would give you enough firepower to stand your ground in the online battlefield. If you're going to win, Lenovo wants you to look snazzy in the process. Gaming laptops have either sported over-the-top designs in recent years or looked like dull slabs of plastic, and Lenovo has managed to slot the Y700 somewhere between the two. Its chassis features two cutaways at either side of the hinge, lending it more than a whiff of Alienware. Unlike that brand, however, the Y700 thankfully doesn't go overboard in the angles department, and its minimal decal placement leaves it looking classier than most. Unlike the Medion Erazer, Lenovo's new out-and-out gaming machine, the Y900 is a more rounded entertainment device. It can be configured with a 15.6-inch 2K display (a touchscreen is optional) or a 17.3-inch Full HD display. It's also available with Intel's sixth-generation Skylake processors. The model we got out hands on housed an Intel Core i7-6700HQ processor clocked at 2.6GHz and backed up by 4GB of RAM (configurable up to 16GB). For storage, the Y700 is available with a 512GB SSD or 1TB hard disk. The Y700 made mincemeat of League of Legends, which isn't the most demanding of games and I'd expect it to chew through tougher titles where you opt for a discrete Nvidia or AMD card inside. Its IPS display is clear and bright with bold colours that look great both in-game and on the desktop. It offers great viewing angles and lets the Y700 live up to its billing as a multimedia machine. It could prove suitable for productivity work too thanks to its keyboard's springy and comfortable chicklet-spaced keys. The 17-inch IdeaPad 700 isn't the heaviest gaming laptop I've ever tried, but it's not definitely not something you'd want to lug around too often in a backpack. On the plus side build quality is excellent - I couldn't detect any flex when prodding and poking at the chassis. It also packs plenty of ports including a USB 2.0 port, a full-size SD card reader, a headset/microphone jack and two USB 3.0 ports, ethernet, a full-size HDMI port and a Kensington security slot. The Y700 can also be quipped with an Intel RealSense 3D camera (on the 15-inch version), which lets you use motion-based apps such as Windows 10's Hello feature that allow you to unlock the operating system with your face. For connectivity, the Y700 features Gigabit LAN, 802.11ac Wi-Fi and Bluetooth 4.0 for hooking up peripherals. On first impressions there's a lot to like about the Y700. Its design isn't hugely exciting, but it's interesting enough to catch your attention without going over-the-top as other bands. The Alienware influence is as clear as day, but it's no bad thing. There's more than enough power under the hood to chew through the latest games, and a healthy port selection combined with add-ons such as Intel's RealSense camera and a touchscreen make the Y700 an intriguing gaming-slash-multimedia offering.